Rapidly rising labor costs are almost universally considered one of the biggest challenges of doing business in China. According to a recent survey conducted by the American Chamber of Commerce in Shanghai, 95.6 percent of US businesses in China consider rising costs to be among their biggest operational challenges. Foreign investors are responding to this phenomenon in different ways. Many new market entrants are setting up in inland China, where wages are lower and local governments frequently offer investment incentives. Even established businesses in China are increasingly relocating their operations to lower cost jurisdictions in cases where their costs have become unsustainable. However, for many investors, China’s more developed coastal regions – where labor costs are the highest – remain the most effective options for their needs. In these areas, businesses benefit from a skilled and experienced labor pool, and are beginning to tap into a new generation of highly educated and internationalized young talent. Regardless of their location, businesses of all stripes are implementing technology like automation and ERP systems to make their HR management more efficient. As labor costs continue to outstrip growth in productivity, successfully integrating technology into HR management makes business operations more transparent and productive, and can free up more resources to invest in talent. In this issue of China Briefing magazine, we take a closer look at these labor-related issues in China. We begin by comparing labor costs across China, and look at ways foreign investors can optimize expenses. 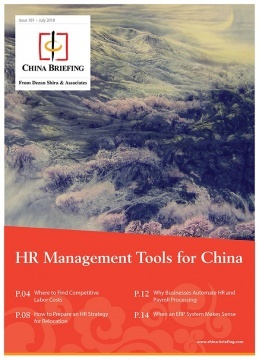 Then, we explain how to create an HR strategy for relocating a business in China. Next, we look at why businesses are beginning to automate HR and payroll processing, before considering at what stage businesses should adopt ERP systems.